Sometimes you want an O/W emulsion but get a W/O. Sometimes you deliberately want to change from an O/W to W/O but it doesn't happen when you want it. These and other frustrations involve emulsion inversion. Once you start to understand inversion by including HLD, a difficult problem becomes much less difficult (though still challenging). Those who don't know the HLD aspect of inversion have (and I have read many academic papers showing this) a very hard time because nothing makes much sense. I have had to invoke the ideas here in a number of very tough formulation challenges involving (or avoiding) inversion and have found them to be very powerful. Cream seems to be a rather conventional O/W emulsion. Yet it is intrinsically unstable. If you mix it vigorously it inverts to a W/O emulsion, i.e. butter. 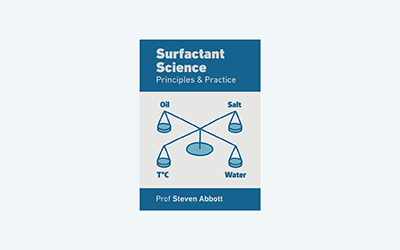 The key to this is that although the surfactant system is "happy" with an O/W emulsion, the overriding fact is that water is below a critical % in the butter and thermodynamics make it preferable to have the small amount of water dispersed in the oil phase. A simple (simplistic) explanation for this comes from Ostwald. Imagine the oil as perfect spheres. At greater than the sphere close packing limit of 74% there simply isn't a way to pack the oil spheres with water surrounding them, so the system has to flip. Following Salager (who yet again has produced so much clarity through his regular use of such diagrams) we can produce a step graph which shows the issues involved. 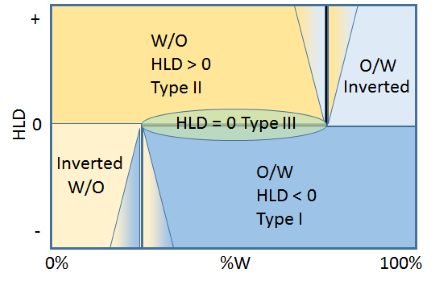 The horizontal line in the middle is at HLD=0 and shows where systems will naturally change from Type I (O/W) when HLD is lower to Type II (W/O) when HLD is higher. However, even if HLD<0, when the % water falls below, say, 25% then the system will want to flip to a W/O emulsion. Similarly, a nice W/O emulsion at HLD>0 will flip into an O/W emulsion when the % oil drops below 25% in the domain of more than 75% water. I have deliberately avoided cluttering the already complicated images with the fact that the inverted phases are often multiple phases. So inverted W/O is often o/W/O where the small o means a drop of oil inside a larger water drop inside a continuous oil phase. Inverted O/W is similarly often w/O/W with water drops inside the main oil emulsion drops inside a continuous water phase. These extra complications can be considered as nature's way to redress the balance of the two species. By having some o inside the W in the o/W/o the oil continuous phase isn't quite as overwhelming. More importantly, these complications can mean that those who play at this boundary can end up with a mess. The o/W/O should shift to an O/W emulsion when more W is added, but things might get stuck the wrong way round. This paragraph is already too long. It has to be included, but the real point of this page is further down - so please carry on reading! To explain the funny triangles, let us imagine having stirred together 15% water in an oil, using a surfactant giving HLD=-1 within this system, i.e. this should naturally be an O/W emulsion. But examination of what we've produced would most likely show a W/O emulsion. Now keep stirring with the slow addition of water. For a while the system will keep producing a W/O emulsion till the whole thing flips into what it knows it should be, an O/W emulsion. When you do such experiments you find that the point of flipping isn't fixed. It depends on % surfactant, HLD, viscosities and stirring speed. So you might find you still have a W/O emulsion up to 60% water, i.e. the yellow triangle spreading from left to right into the blue. But if you started with a normal 60% O/W emulsion and started to add oil, you might find you had to go to 85% oil before it flipped, i.e. the blue triangle spreading from right to left into the orange. To return to foods. Mayonnaise is an O/W emulsion with 70-80% oil very close to the inversion limit. If mixing is done by hand and the oil is thrown in quickly, the result is likely to be that the water accepts it is a minority and you get a horrid W/O failed mayonnaise. However, with a high-speed mixer the thermodynamic (based on HLD) O/W emulsion can be obtained. 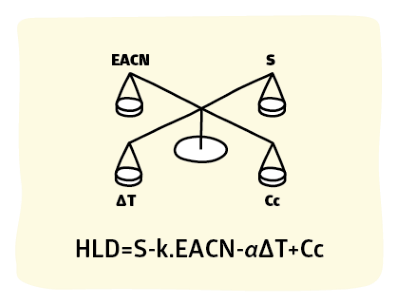 A complication is provided by viscosity. In general, the water phase is low viscosity but the oil viscosity can vary from low ηLo to super-high. At higher viscosities ηHi it is very hard to get a high %W W/O emulsion as the inversion zone to O/W shifts to the left. The viscosity of the oil makes almost no difference to the high %O W/O emulsion inversion line. All the above is really a prelude to this section. 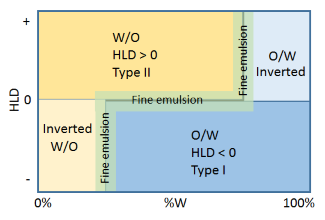 The point about the horizontal HLD=0 line is that the interfacial energy is a minimum so it is easy to create a fine emulsion with the least expenditure of energy. The point about the vertical inversion lines is that for different reasons the interfacial energy is finely balanced so it is especially easy to create emulsions at these points. Hence the label "fine emulsion". The catch is that for the same reasons as it is easy to create an emulsion it is easy for the emulsion to fall apart via coalescence (there is only a small energy barrier). So to make an emulsion at these points is a high-risk strategy unless you know what you are doing. 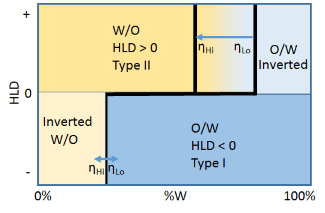 The most widely-known strategy along the HLD=0 line is PIT, Phase Inversion Temperature, where the HLD of an ethoxylate system becomes more positive with temperature. So you heat to, say, 50°C to get HLD=0, create an emulsion in this easy region, then rapidly cool to 25°C which brings the HLD safely into the -ve region where the emulsion is stable. The PIF app stresses that PIT is only a subset of various Phase Inversion Formulations where HLD is varied with salt, oil or Cc. For emulsions round the inversion lines you need to be able to swamp with water for the bottom line and with oil for the top line. If you do things right then you get an excellent fine emulsion for very little effort. Unfortunately, because of the complications of o/W/O and w/O/W emulsions you sometimes get a disaster - depending on HLD, stirring speed, viscosities etc. This page can't tell you how to avoid all such disasters. But if you don't understand the fundamentals described in this page then you are lost. I can say this with confidence because I was very late coming to grasp all this and many aspects of these sorts of emulsions were a total mystery to me.